If Aunt Acid were to write a tell-all book about her life as a modern muse and spokesmodel, this might be it. Of course, she’d NEVER do that—there are some things a body just keeps to themselves, if they are honorable. And then there’s the stories you tell at private parties but never in print. Although the most fascinating details might never hit print, there’s always something of interest going in THIS spokesmodel’s career, and its not just hitting the runways, or hitting the help like SOME supermodels. We pick up after ourselves around here, ladies and gents, in the belief that no one is so special they can’t put their own undies in the hamper. 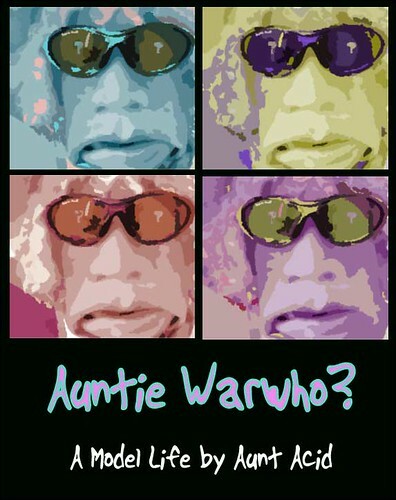 A calender of artistic spoofs is in the works for some future year, and here you see a print of Aunty in the style of Andy.